The European space agency's mission to assess the state of the world's ice cover is likely to launch in February. The Cryosat spacecraft will go into orbit on a Dnepr rocket from Baikonur, Kazakhstan, the agency has announced. 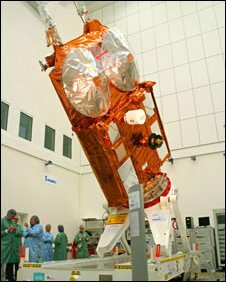 The satellite is a rebuild of the mission that was destroyed in 2005 when its launcher failed just minutes into its flight. Cryosat-2's radar instrument will make detailed maps of the ice that covers both sea and land at the poles. Data from other satellites, such as the US Icesat and the European ERS/Envisat missions, has already indicated that some of this cover is diminishing at a rapid rate in response to climate change, with the biggest melting occurring in the Arctic. Cryosat will add significantly to the information scientists already possess, making observations that are beyond the current generation of spacecraft. The completed Cryosat-2 is undergoing final checks here at the IABG technical centre in Ottobrunn near Munich, Germany, a test facility used by satellite manufacturers. The mission is led scientifically from the UK, however. Its principal investigator is Professor Duncan Wingham at University College London. It was hoped Cryosat-2 could launch in December, but the flight has been delayed now until next year. Esa said there was a queue of missions waiting for a ride on the Russian-Ukrainian Dnepr rocket, an intercontinental ballistic missile that has been converted for use by civil space programmes. "Yes, it's frustrating, but that's how it is," conceded Volker Liebig, Esa's director of Earth observation programmes. "On the other hand it gives us a little bit more time to [train and prepare the ground team], which means when we do get into orbit we'll be ready to start operations rapidly because of all the work we've done in advance." Mission managers are targeting 28 February for a launch. The inability of the agency to loft its satellites at a time of its choosing should become less of a problem when it has access to its new Vega rocket. Vega, which will operate out of Europe's Kourou spaceport in French Guiana, has been designed specifically to carry small institutional payloads such as Cryosat to orbit. However, the rocket is not expected to enter into service until the middle of next year. 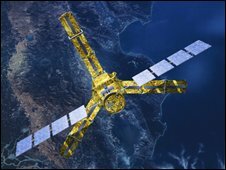 Cryosat-2 is part of Esa's Earth Explorer programme - seven spacecraft that will do innovative science in obtaining data on issues of pressing environmental concern. The first in the series, Goce (Gravity Field and Steady-State Ocean Circulation), was launched in March.